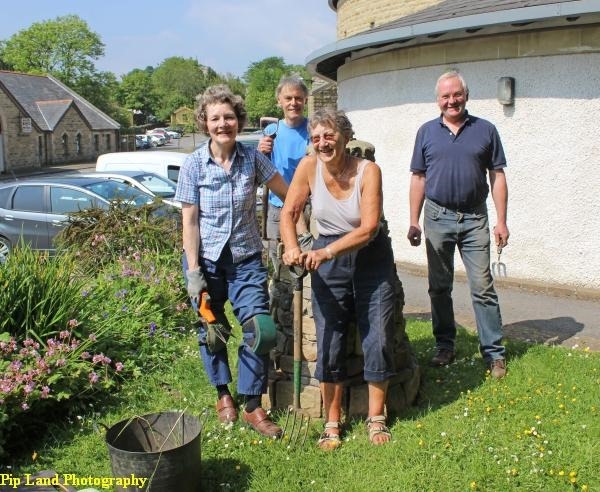 Dales Countryside Museum – walling, knitting, gardening and Mick Jagger! I learnt a lot during the past 10 days of visits to the Dales Countryside Museum. 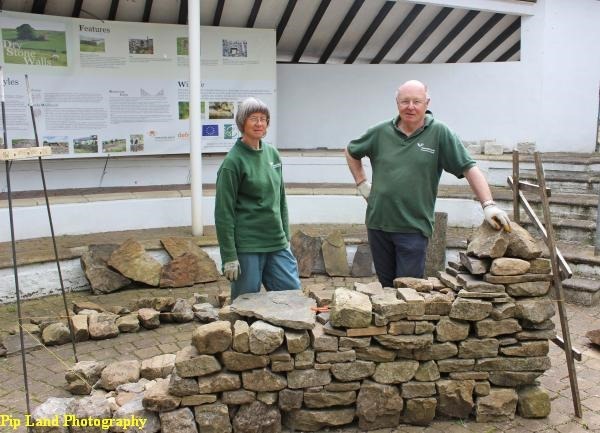 It began with a demonstration of dry stone walling by David Wright and Pam Norris. A few days later I watched Kate Trusson knitting with a knitting stick. 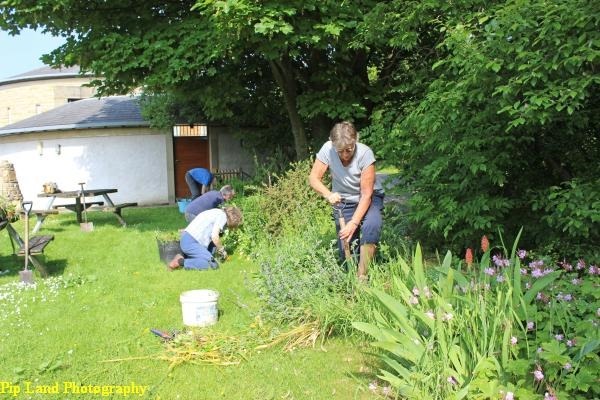 On my next visit I put my camera down and worked alongside other committee members of the Friends of the Dales Countryside Museum as they weeded and tidied up the garden. And I spent yesterday helping others research their family histories – only to learn something about the history of St Andrew’s church, Aysgarth and the ancestry of Mick Jagger. 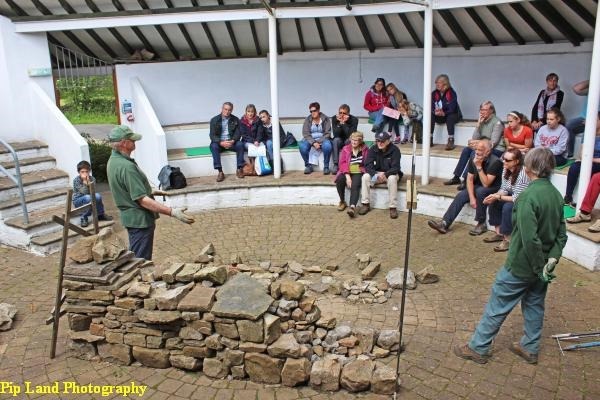 Above: Some visitors to the museum were fascinated by the demonstration of dry stone walling given by David and Pam. 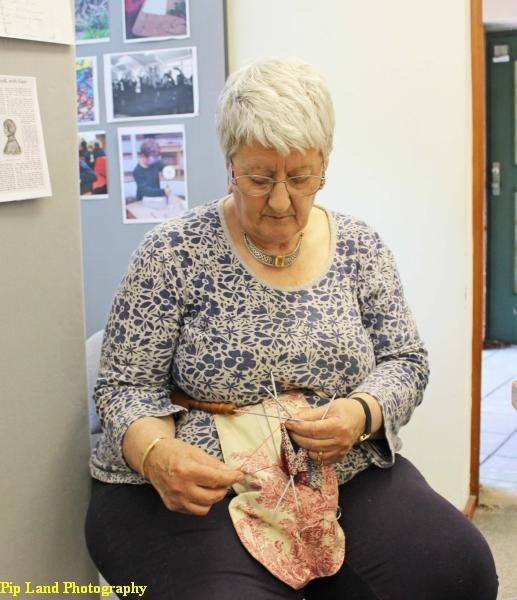 Another traditional skill is that of using knitting sticks. Kate Trusson pointed out that the DCM has one of the best collections in the country. “The best two days in my life were in this museum looking at the knitting sticks and describing them for the catalogue. It was wonderful,” she said. 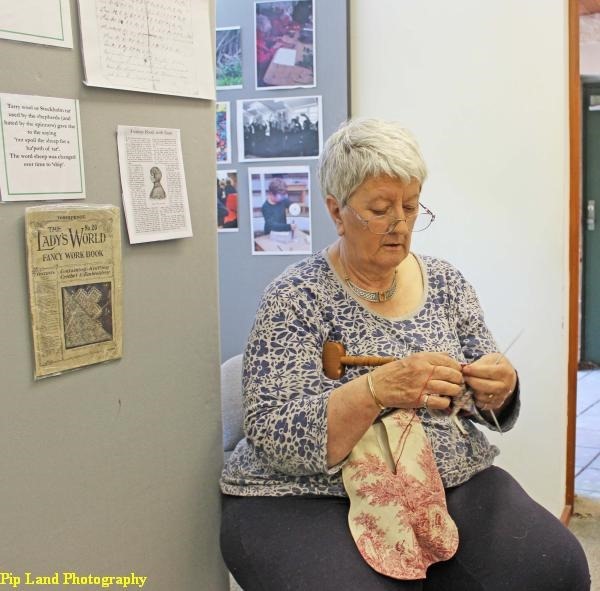 During her demonstration she showed visitors how, centuries ago, local knitters used a knitting stick so that they could keep one hand free. This meant they could carry on knitting while doing other jobs. Their knitting supplemented the meagre family income in areas like the Yorkshire Dales and the Scottish Isles. “You just have a piece of wood with a hole in it, stick it in your belt, and off you go,” she explained (left). Many of the sticks were carved into attractive shapes and so old knitting sticks have now become collectors’ items. The museum also has a good selection of leg boards. Kate explained that the knitters would knit stockings too large as this meant they only needed to remember one pattern and could work very fast. The stockings would then be put on the correct-size leg board and felted down. Sweaters were also felted down. Kate will return to the museum in September to give another demonstration of traditional knitting. The Friends of the DCM have the knitting stick as their logo, inspired and drawn by the artist Janet Rawlins over 20 years ago. Friends committee members, Sue Foster (chairman), Marilyn Cruikshanks, Martin Garside and Brian Alderman needed rather different implements on June 9 – and I put my camera aside for a while to join them. They had set themselves the task of weeding and tidying the cottage garden at the east end of the museum. This was created by Sally Reckert and some DCM Friends in 2007 with the objective of showing what sort of plants were grown in a small upper-dales cottage garden between 1900 and 1960. Marilyn commented: “We have not strayed too far from the original planting,” and added that the peonies and honesty were looking good alongside the catmint and forget-me-nots. The potato patch is also doing well. Below: the team at work. In the bottom photograph are, from the left, Marilyn, Brian, Sue and Martin. I returned to the museum on Monday (June 13) for duty in the research room. I often sit there on my own and so took my laptop and some work with me. But this time there were family researchers waiting to get started at 10am. Jeremy and Kathy Kettlewell had already done a lot of research on their family history and had come prepared for a full day at the museum. Thanks to the hard work of Friends in the past (like the late Marian Kirby) there were plenty of transcripts of Anglican and Methodist church registers for them to study plus more nuggets of information tucked away in the Macfie-Calvert collection. As I searched for additional information for them and for another researcher I found some nuggets myself. One of these was in a 1910 Almanack and described the post-Christmas festivities in Swaledale in the 19th century. That is likely to be reproduced in this year’s Now Then, the annual magazine of the Friends of the DCM. And the Kettlewell’s had an interesting story to share with me. One of their ancestors was Thomas Kettlewell who lived near Aysgarth with his family in the late 19th century. In the 1881 census he was listed as having a lodger: Charles E Jagger, 21, professor of music and a composer who was, at that time, the organist of Aysgarth Church. The Kettlewells then showed me an article written by Matthew Beard which was published in the Independent in March 2006. This stated that Charles Jagger became a renowned classical composer and was commissioned to write the wedding score for the Duke and Duchess of Kent. He also had four children and one of his descendants, Mick Jagger, is renowned for a very different style of music.